It all started in 1993. We were wanting to expand our Fleckvieh herd and took the opportunity to purchase an adjacent, mainly pasture farm that spring. Later on that fall we were successful in obtaining the entire 100% Fleckvieh herd from Keith Bloder, Unity, Saskatchewan. Our first order of business that summer was to get our new farm fenced. Wanting to get away from the old traditional barb wire/woven wire, we had to learn how to fence all over again when we went with the more modern high tinsel. Not knowing any better we fenced the perimeter and turned our cows out. However by mid August, pastures were worn out and we were starting to feed hay. Our supplier of our new fencing material, (Andy McDonald), had mentioned ” rotational grazing”, a totally new concept to us here. Being frustrated with having to feed out hay that we had stored for winter use, something had to give. The following spring I enrolled in a pasture management school at Owen Sound. The instructor whose name escapes me was from Rocky Mountain house, Alberta and was speaking from several years of rotational grazing experience. I must admit I was somewhat sceptical. However no matter how I tried, he had an answer for me. Cattle being turned into waist high grass? Answer – that is not waste, what they tramped down becomes fertilizer. I have been clipping or spraying weeds in our pastures? Answer, you are dealing with the symptom, the cause is over grazing. Do I need to re-seed our pastures? Answer, there is enough grass seed in the ground for the next 100 years. I could go on. However, wanting value from my course fee, I listened very carefully, but was certain this concept called “rotational grazing” probably would not work here at Dora Lee. 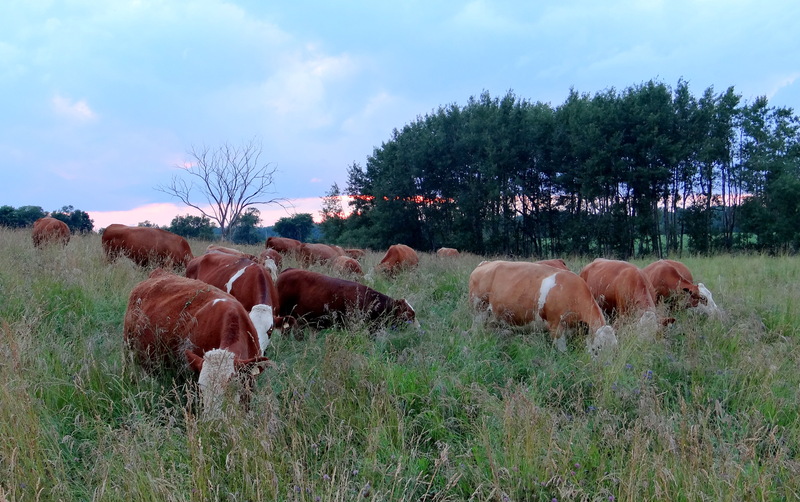 We started out by dividing our pastures into 20 acre paddocks, then into 10 acre paddocks. But really not much had changed after year two. We also started mixing trefoil seed into our free choice mineral during pasture season and had minimal response. We still had those nasty weeds in our pastures, and were still feeding hay come late August. By year 3 we were pleasantly surprised. Things began to change, less weeds – more grass !!! Now, years later, cow paddocks are 5 acre parcels, bred heifer and first calve heifers are in 2 1/2 acre parcels. Maximum grazing is 5 days per paddock, no more weeds and yes, we are turning our cattle into waist high grass these days. 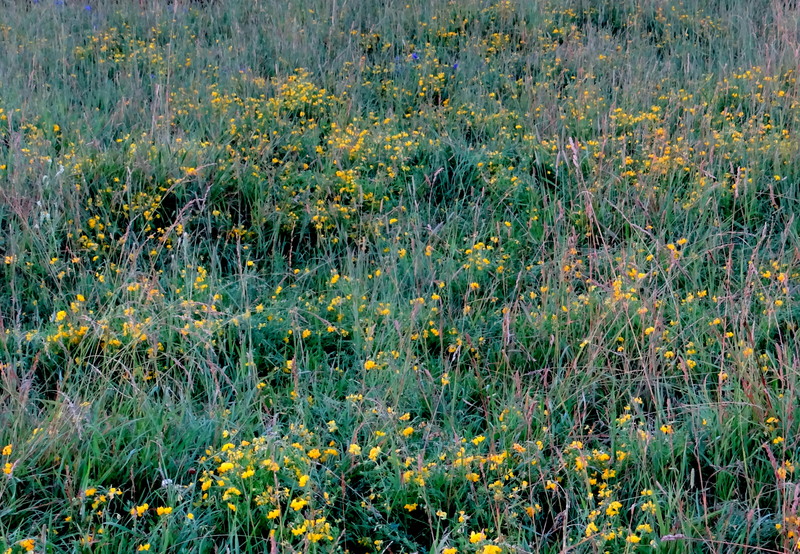 Many areas of our pastures are yellow with trefoil flowers, spread and planted by our cow herd. The summer of 2012, many say was the driest here in Ontario in 50 years. Our pastures were fine. They had the root systems in place to handle the drought. We now are feeding hay come mid November when our cows come in off grass for the winter. I do not know much about winter grazing, but we will be taking a look. It has been an interesting journey, something I have enjoyed very much. Some good advice from my father many years ago, “man needs to stay on top of change and new technology.” Dad was right.